Linear One Exterior and Interior, linear, low profile, single-color, high-output LED fixtures for wall grazing and cove applications are available in 1- and 4-foot sections, and install with no visible cables. Linear One is available in 2700K, 3000K, 3500K and 4000K with at 80 and 90 CRI. Its wide range of beam angles include 10 degree by 10 degree, 30 degree by 30 degree, 60 degree by 60 degree, 100 degree by 100 degree, 10 degree by 25 degree, 10 degree by 40 degree, 10 degree by 70 degree, and 40 degree by 70 degree. Linear One offers 1 to 100 percent dimming through its internal 0-10-volt driver or DMX dimming through an optional UDM (universal dimming module). Linear One operates on a 100-277VAC power supply and consumes 12 watts per foot. It features a robust aluminum, marine environment ready housing. 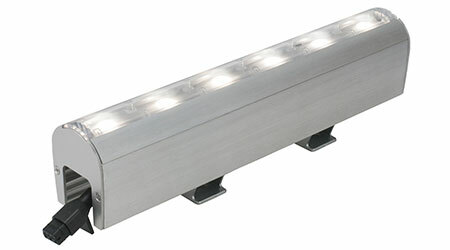 Rated IP66 for wet locations, Linear One Exterior performs in -40 F to 131 F. Linear One Interior is IP40 rated for dry locations and performs in -4 F to 113 F. Both exterior and interior units maintain 70 percent of their lumens for 150,000 hours.